2019 2nd Annual Frühlingsfest/Maibaumaufstellen “Spring Fest”: GAK will open up the Edelweiss biergarten for the season with our second annual Frühlingsfest, the weekend of April 26th and 27th. Just as last year, this “Spring Fest” will crescendo with the “Maibaumaufstellen”–the raising of the May Pole over the biergarten! Our fest will feature the GAK official bier of spring: Mashcraft’s Maibock, and a Mashcraft tap takeover for the weekend. 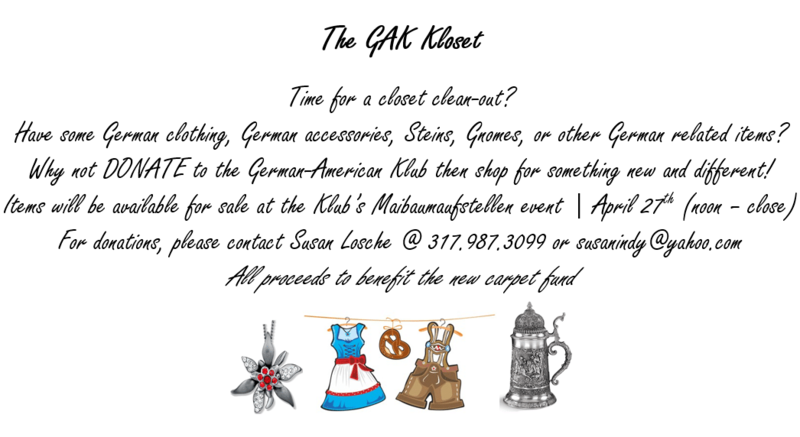 Events include: German Auto Show, Euchre Tournament, GAK Closet, Live Music and Dancing, and lots of family fun. Federation Fest Fundraiser: German Park was vandalized twice this winter. Many repairs are needed and the coffers are thin. Please come to the Edelweiss on May 3rd for Fun, Friends, Food, and 8 bands. If you cannot make it please donate on our GoFundMe page. Click Below.